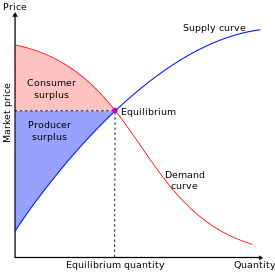 Dupuit originated the concept of consumer’s surplus. But, it was Marshall who popularized it by presenting it in a most refined way. Marshall viewed that when a consumer buys a commodity, his satisfaction derived from derived from it may be in excess of the dissatisfaction he has experienced in parting with money for paying its price. This excess of satisfaction is called” consumer’s surplus”. This concept is based on the law of diminishing marginal utility. Consumer Surplus = Price Prepared – Actual Price Paid. Therefore, OMRQ – OPRQ = MRP (consumer surplus).